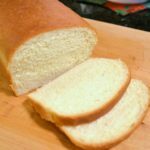 Buttermilk bread recipe is very simple even a beginner can make it. The bread is made with all purpose flour, butter, buttermilk, yeast and a little bit of sugar mixed together in a large mixing bowl. This recipe is an old German recipe that has a tender crumb on the inside and crusty edge on the outside making this bread great for sandwiches, toasting and Thanksgiving dressing. Combine 2 cups flour, sugar, salt, baking soda, and undissolved yeast. * you could also use rapid rise yeast if desired. Attach regular mixing flat beater to stand mixer, you will use this beater mixing the wet and dry ingredients, then switch to the bread dough hook. Heat buttermilk, water and butter over low heat until liquids are warm. (mixture will appear curdled). Wet ingredients should be at a temperature of 110-115 degrees if using the regular active dry yeast, but for rapid rise your wet ingredient temperature should be 120 degrees, but not warmer. If water is too hot it will kill your yeast and your bread will not rise. Add to dry ingredients; beat to combine with flat beater and then let it rest for 5 minutes. Add 1 cup flour, Beat at high speed for 2 minutes. Remove beater and attach bread dough hook. Add another cup of flour and on medium speed mix to make a soft dough. If dough is not forming a ball in the bottom of the mixing bowl, add more flour a little at a time until dough is cleaning the sides of the mixing bowl. Place in greased bowl, grease top of dough. Cover with tea towel and let rise until doubled. about 1 hour. Punch dough down, turn onto floured board. Knead a couple of times, maybe 2 minutes to make dough smooth and satiny/elastic. Be careful not to over flour the dough. The dough will be tough if you use too much flour. Dough should not be sticky and move easily ..soft and pliable. Divide dough in half. Shape into 2 evenly sized loaves. Place each loaf in a greased 8 ½ x 4 ½ x 2 ½ “ pan. Bake at 375 about 35 minutes or until done. Remove from oven and brush with melted butter if desired. This bread will freeze well after baking. Wrap in plastic wrap and then foil to freeze. Great bread for dressing, sandwiches, and toast.